The world of Stranger Things is going beyond Netflix. First, it was revealed several prequel novels would be published. Then Tell Tale games revealed they’re working on a video game based on the popular series. Now, Entertainment Weekly reveals they’ll be coming to comics later this year. Netflix has teamed up with Dark Horse to publish a line comics. The first series comes out this September. This new deal will consist of a “multi-year publishing line” that let’s Stranger Things fans “explore the mysterious world of Hawkins, Indiana,” according to Dark Horse. 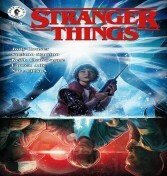 The first series will follow Will Byers (Noah Schnapp) after he was sucked into the Upside Down at the beginning of season 1. The four-issue series is written by Jody Houser, illustrated by Stefano Martino, inked by Keith Champagne, colored by Lauren Affe, and lettered by Nate Piekos. The first issue hits stores September 26. Things are picking up for Warner Bros.’ Joker origin movie directed by Todd Phillips and produced by Martin Scorsese. Last week, the movie’s working title was revealed along with the possible filming location and start date. But the latest bit of information revolves around who will star alongside Joaquin Phoenix. Reports suggest the studio is eyeing none other than Robert De Niro. According to That Hashtag Show, De Niro is being eyed for the role of Murray Franklin. This wouldn’t be De Niro’s first time working with Scorsese. The two have worked together on acclaimed movies like Taxi Driver, Goodfellas, and Cape Fear. Phillips’ movie is only one of six featuring the Joker than Warner Bros. has in the works. Along with this project, they’re also working on a Joker film starring Jared Leto, Birds of Prey, Suicide Squad 2, the Harley Quinn solo film, and the Joker and Harley Quinn film. Michael B Jordan returns as boxer Adonis Creed in the debut trailer for Creed II. The sequel to the 2015 Rocky spinoff stars Jordan and Sylvester Stallone as former heavyweight champ and Creed’s trainer, Rocky Balboa. The intense trailer shows Adonis preparing for a fight that even Rocky thinks won’t end well. It’s not until the closing seconds that we learn who Adonis’ opponent is: the song of Ivan Drago, the boxer who killed Creed’s father Apollo in Rocky IV. "Life has become a balancing act for Adonis Creed. Between personal obligations and training for his next big fight, he is up against the challenge of his life. Facing an opponent with ties to his family's past only intensifies his impending battle in the ring. Rocky Balboa is there by his side through it all and, together, Rocky and Adonis will confront their shared legacy, question what's worth fighting for, and discover that nothing's more important than family. Creed II is about going back to basics to rediscover what made you a champion in the first place, and remembering that, no matter where you go, you can't escape your history." Directed by Steven Caple Jr., Creed II opens in theaters November 21. MTV is getting on the reboot train and announced plans to bring back classic MTV shows as part of its new production unit, MTV Studios. Included on the initial lineup is Daria, The Real World, Made, and a live action reboot of the animated classic Aeon Flux. The studio will also work on two new shows: The Valley, a “coming of age docu-series” about a group of friends growing up in Nogales, Arizona and MTV’s Straight Up Ghosted, about young people attempting to reconnect with “lost friends, lovers and family members and confront them about why they have been ghosted." For the Daria reboot, MTV Studios announced it will focus on Daria and her friend (?) Jodie Landon. Tentatively titled Daria and Jodie, the show’s description says "These two smart young women take on the world, with their signature satirical voice while deconstructing popular culture, social classes, gender and race." It’s unclear whether this will a reimagining of the original series or if it will pick up after high school. Fans of the original show may remember Jodie and Daria were like acquaintances than friends. Her best friend was Jane Lane. What do you think about these upcoming MTV reboots? Things are looking kind of grim for this Star Wars franchise. After the disappointing box office returns of Solo: A Star Wars Story, Lucasfilms and Disney are reportedly putting future Star Wars spinoff films on hold indefinitely. According to Collider, those working on the anthology film following Obi Wan Kenobi are no longer on the project. James Mangold was supposed to direct a Boba Fett movie, but it’s unclear what will happen with the movie. For now Lucasfilms will focus Star Wars: Episode IX and the future trilogy. Solo: A Stars Wars Story was met with mixed reviews and will earn roughly $400 million at the worldwide box office. Considering it’s the most expensive Star Wars film ever made, it could lose Disney and Lucasfilm more than $50 million. Directed by Ron Howard Solo: A Star Wars Story stars Alden Ehrenreich as Han Solo, Donald Glover as Lando Calrissian, Emilia Clarke as Qi’ra and Joonas Suotamo as Chewbacca. They’re joined by Thandie Newton as Val, Phoebe Waller-Bridge L3-37, Paul Bettany as Dryden Vos and Woody Harrelson as Tobias Beckett. The movie is in theaters now. Could Captain Jean-Luc Picard return to Star Trek? It could happen according to Alex Kurtzman. The executive producer behind CBS’ Star Trek: Discovery recently renewed his deal with the network signing a five year extension. He’ll now serve as the show’s lone showrunner after taking over from Aaron Harberts and Gretchen Berg, who were fired from the series. Kurtzman plans to expand the Star Trek franchise with more TV shows, miniseries, and other content. But the most exciting revelation is the new Star Trek series featuring Patrick Stewart reprising his role as Star Trek: The Next Generation’s Captain Jean-Luc Picard. After rumors spread about a new series starring Stewart, sources revealed Kurtzman and Akiva Goldsman are attached to the project. Right now CBS Studios isn’t confirming the project since sources say the deal is not complete and may not even happen even though Stewart has already teased his return.